The Isle of Man cricket team have lost to Sweden in their second group match at the ICC European Division Two Championship in Corfu. 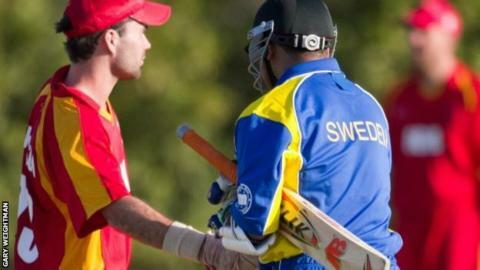 Sweden claimed a five-wicket victory to top group B after the Manx had earlier defeated Cyprus by 19 runs. The Isle of Man opened the batting with Max Stokoe top scoring as they made 136-6 off 20 overs. Sweden reached their target with 11 balls remaining, after some impressive boundary shots. Earlier in the day Gareth Dawson's side had made a winning start against Cyprus. Max Stokoe and Gareth Morris got the Manx side up and running quickly with an opening stand of 94 as the island reached 166-3 from their 20 overs. In reply Syed Hussain hit five sixes for Cyprus but his side fell short of the Isle of Man's total. Alex Stokoe returned figures of 3-33 as the Cypriot challenge ended on 147-8. The Isle of Man will be looking to improve on last year's third-place finish in Belgium and make the final of the competition in Corfu. The winner of the competition will gain promotion to next season's Division One tournament. The Manx side's next fixture will be against Greece on Tuesday. They will also meet Croatia and Finland in Group B.